Hundreds of millions of young students in India and China (and the rest of Asia) are hoping to escape their parent’s lives of poverty, manual work, or stultifying government sinecures, and find a real professional job. To do that they need to claim a very limited slot in one of a very few good universities. And then graduate. Only a very tiny percent of those hoping for this dream make it. The pressures are immense. It is not uncommon for Asian families to expect, even demand, that their sons be engineers and their daughters doctors. No questions, or unhappiness, permitted. It’s your family duty. This is the cultural context for the mega-hit Bollywood film 3 Idiots. 3 Idiots tells the story of three engineering students who are pressured by their society to pursue a degree they are not really suited for, and how they are swayed by a renegade student who wants them to follow their bliss instead. Under his influence they begin to flunk out, unleashing all kinds of mayhem and ruining their lives. Now the film has the attention of every young person in Asia; what happens next? The answer is two hours of very funny comedy, over-the-top self-spoofing Bollywood dance numbers, sappy romance, tear-jerk suicides, nutty antics in exotic locations, and a very profound message. I’ve seen 3 Idiots twice already, and am ready to see it again. I am not the only one who thinks the film is great. 3 Idiots is the largest grossing Bollywood film of all time! It is the biggest hit India has ever seen. This film is a bigger event in India than imported mega-hits like Avatar. If it is not your story, it is the story of your best friend. Everyone in Asia connects with it. If you have never seen a Bollywood movie and want a fantastic one to start with, watch this one (in Hindi with English subtitles). More importantly if you want to understand the inner lives of all the hundreds of millions of young professionals ready to do your own job, watch this film. It’s a blast. Don’t be put off by the title or marketing posters. 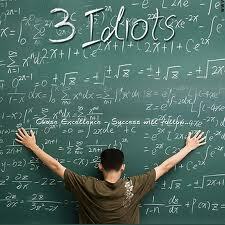 The 3 Idiots are not 3 Stooges, or 3 Dumb and Dumbers, but more like 3 Rascals or 3 Renegades. The official US edition (English subtitles) has just been released. My friend Tyler MacNiven produced a documentary about one of the actors in 3 Idiots. He follows the unknown Indian-American actor who plays “the Silencer.” He gets his life turned upside down as he becomes a mega-star in movie-star-crazed India overnight — mostly because of one very funny speech in the middle of this film. Tyler is premiering his documentary, Big for Bollywood, in San Francisco, Thursday, May 19th at the Red Vic Movie House; Screenings at 7:15 & 9:15pm. Merci de partager belle,pour ce blog sympa. Thank you for sharing beautiful, for this nice blog. Vielen Dank für diesen schönen Blog.